We mightn't be getting a (non-MMO) Monster Hunter game on PC any time soon, but Dynasty Warriors peeps Tecmo Koei and Omega Force are more than happy to step into the void in the meantime. 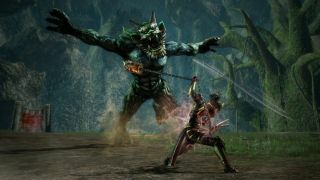 Their demons/medieval-Japan-themed Monster Hunter clone Toukiden: Kiwami is coming to Steam later this month. June 26th, to be exact. What are you doing on June 26th? Work? Family commitments? Wrong: you're going to be slicing up monsters in this enhanced version of Omega Force's Toukiden: The Age of Demons. Kiwami (released earlier this year on Vita and PS4) features twice the number of demons of the original 2014 version, along with two new characters, a longer story mode and more.